Concrobium Moisture Grabbers absorb excess humidity to protect surfaces and possessions against moisture damage, musty odours, rust and corrosion. The Moisture Grabbers pouch traps moisture on the inside and stays completely dry on the outside. One pouch will treat an indoor area up to 350 cubic feet. Use it in closets, bathrooms, cabinets, pantries, storage bins/totes, safes, lockers, luggage, sports bags, cars, trucks, RVs, campers and boats. Satisfaction guaranteed. Please call 1-866-811-4148 for more information. 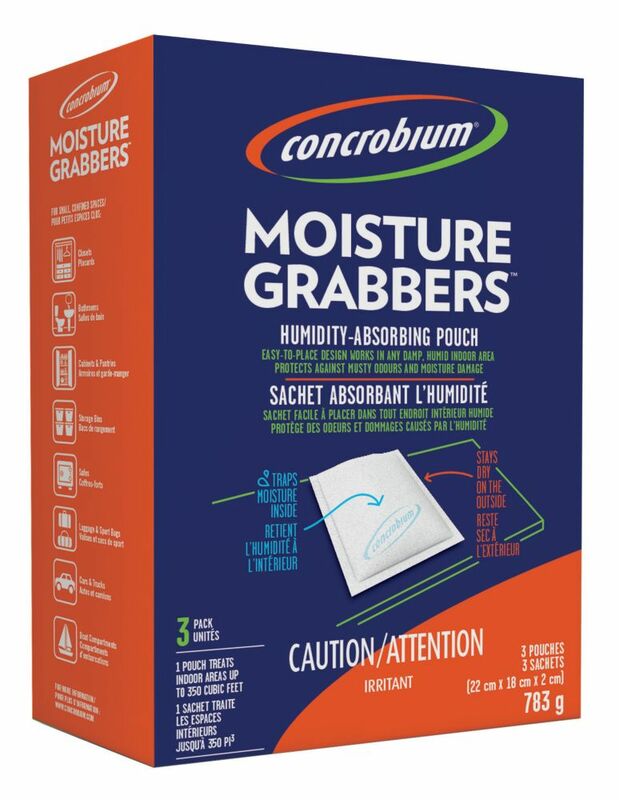 Moisture Grabbers (3-Pack) Concrobium Moisture Grabbers absorb excess humidity to protect surfaces and possessions against moisture damage, musty odours, rust and corrosion. The Moisture Grabbers pouch traps moisture on the inside and stays completely dry on the outside. One pouch will treat an indoor area up to 350 cubic feet. Use it in closets, bathrooms, cabinets, pantries, storage bins/totes, safes, lockers, luggage, sports bags, cars, trucks, RVs, campers and boats. Moisture Grabbers (3-Pack) is rated 4.6 out of 5 by 229.